Last semester a group of Mount students headed to New York City to see “Waitress” a broadway musical. Now, Student Activities has gotten tickets for another great broadway trip! 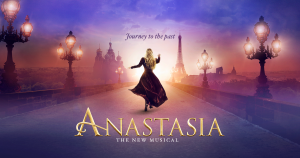 This semester the Mount is heading to the Broadhurst theater in NYC to see “Anastasia.” This musical is loosely based on the sad and dark tale about the Romanov family, who were the last royal family in Imperial Russia. In this tale, however, Anastasia is supposedly the only Romanov alive once the Soviet party has taken over. Her grandmother, who is in Paris, has placed a reward for anyone who can find her. Although Anastasia is possibly missing, we shift our story to focus on a young girl named Anya who is orphaned and seems to not remember her past. Anya meets Vlad and Dmitri, who believe they can use her to get out of Russia and find Anastasia’s grandmother to get the huge reward. Gleb, a soviet soldier who’s had a difficult past, sets out to stop Anya and her friends as he believes anyone trying to leave Russia or trying be a wannabe princess must be stopped and face a heavy consequence. The journey that you will witness with Anya and her friends is one full of excitement, hopelessness, and, as always, the love of friends and family. Anya is currently played by Christy Altomare who was nominated for the 2017 Outstanding Actress in a Musical by Drama Desk Awards. Not only is Christy Altomare an original cast member, she is also accompanied by fellow actors and actresses such as Derek Klena, John Bolton, Caroline O’ Connor and Mary Beth Peil, who are all original cast members with almost all being nominated for multiple awards within the Broadway community. After seeing this show you will not only fall in love with the album, as the music has a catchy and sensible tone that brings you back to the days of a time when tsars had lavish ballroom parties, you will also fall in love with the cast as they put on a phenomenal show with great emotion and care for their audience. I saw this show in December, or as Ayna sings “Once upon a December,” and I feel this show is truly wonderful. If you are interested to see “Anastasia” on Broadway please visit the link that Student Activities will be sending on Feb. 15 at 4:30 p.m. to purchase tickets, which will be priced at $30. Tickets do sell fast so please make sure you buy them ASAP if you want to get your spot. The date of the show is Sunday, Feb. 25, with free transportation departing at 1 p.m. and an approximate return of 7:30 p.m.